"We have the honor to inform you that we have repaired and put in good order the Chronometer Negus 1366, recovered from the Arctic Regions by the English Arctic Expedition. 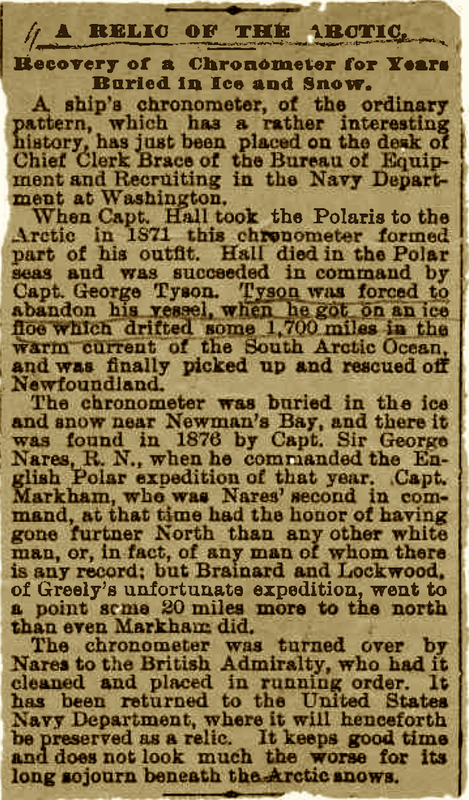 We found in an excellent state of preservation, considering its exposure through four Arctic winters with the thermometer recording as low as 104 degrees below freezing, as reported by Captain Nares." 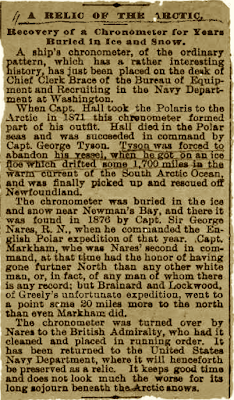 Put through its time trials, it was found to be accurate to within two-tenths of a second in twenty-four hours, which Negus noted was "but a slight variation from the rate it had in June 1871, when we rated it for the [Polaris] expedition." It was then decided not to issue it to another vessel, but -- as the logbook of the Observatory indicated -- to "keep it as a trophy for the Naval Museum." In 1893 it was displayed at the World's Columbian Exposition in the Naval Department, next to one of the chronometers that had been issued to the equally ill-fated Jeanette expedition. 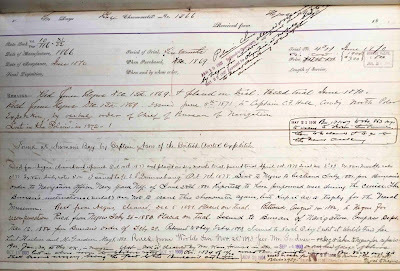 The logs of the Observatory chronicle other minor events in its career, including an additional time spent back at its makers for cleaning and adjustment in 1906. After that, the trail grows cold, and by the time that the historical collections of the Observatory were inventoried in 1993, the only item recorded was the brass plaque that once adorned its wooden case. I've written to the Observatory's library to inquire after it, and have received a number of helpful replies, the effect of which is that they have not yet been able to determine its present location. 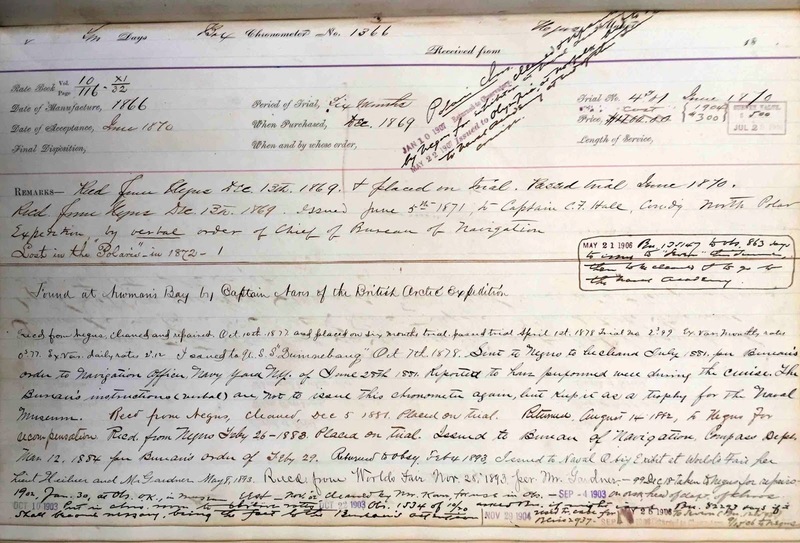 It's possible that Negus 1366 was transferred to another agency, perhaps one of the Smithsonian museums, or that it had been leant out for some other purpose, without a record being made, then not returned. I hold out some hope that it may yet found; it's hard to imagine a more storied instrument, bound up so intimately with both American and British exploration in the nineteenth century -- and I have a feeling that, if it is, it will still be found to keep excellent time. Interesting how things "go missing". Amazing how durable it proved to be.